Ducati Scrambler and Italia Independent present their new creations in Miami. During the week of the prestigious contemporary art exhibition “Art Basel” at the Setai Hotel, the two brands launched a new limited edition Ducati Scrambler and a collection of dedicated sunglasses inspired by the “Land of Joy,” the theme that characterizes the iconic motorbike made in Bologna. This is a global partnership based on a three-year collaboration agreement and unites Ducati and Italia Independent for the first time, creating an incredible mix of Made in Italy style and creativity. 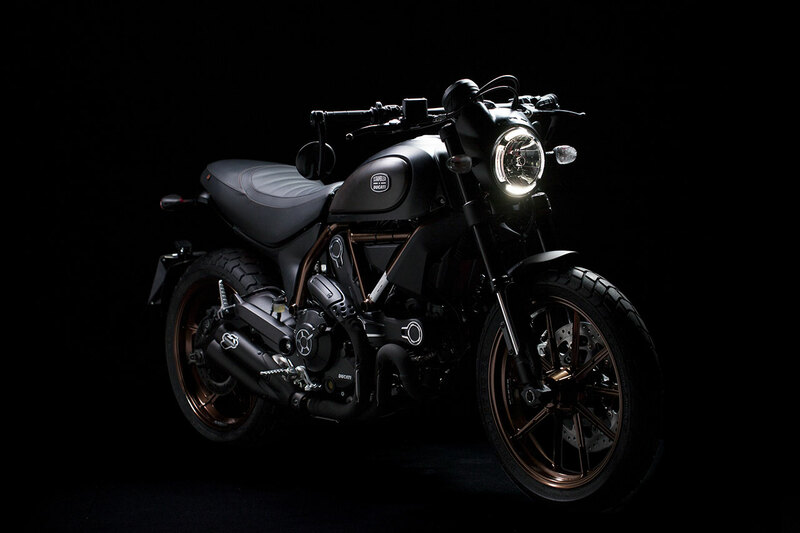 The focus of the collaboration is Ducati Scrambler, the brand created by Ducati to interpret the values of the iconic 1970s motorbike, introduced in the United States and shortly after achieving international acclaim. A special logo, representing the union of the two different souls from which the project originated, has been designed to characterize the products that will be developed together. While the new Ducati Scrambler Italia Independent is an original, unique interpretation of this motorbike, aimed at a sophisticated clientele interested in new trends, it still maintains the fundamental elements that distinguish the brand. Created in limited edition with only 1,077 units, the bike is enhanced by an aluminium plate with laser etching of each unit's serial number. The Ducati Scrambler - Italia Independent logo is present on both sides of the tank as well as on the label on the exclusive leather seat. 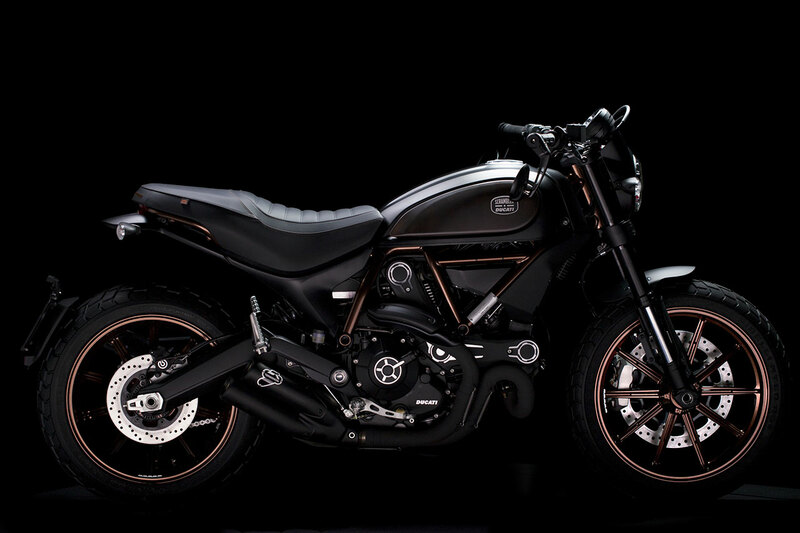 The Ducati Scrambler Italia Independent is inspired by the world of the “cafè racer” and stands out thanks to a series of hand-crafted details developed together by the creative teams of the two companies: a black engine with brushed cylinder head fins and visible machining, black full exhaust unit with Termignoni silencer, low handlebar with variable section and aluminium rear mirrors mounted on the ends. The short front mudguard, the essential nose fairing, the frame and the wheels painted “Night Copper” (colour designed for this special edition), the seat with stitching in the same colour with the embroidered Italia Independent logo on the back further embellish this version. The “Matte Black” colour of the entire bike and the side panels of the tank, created by an artisan brushing process reminiscent of the "Night Copper” of the wheels and chassis, emphasise even further the “café racer” soul of this new bike. 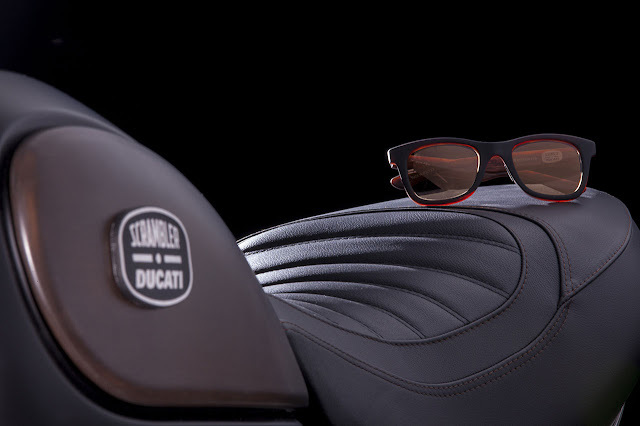 The Ducati Scrambler sunglasses created by Italia Independent and dedicated to the new bike from which they were inspired are both elegant and sporty. A classic, timeless shape, dark black with rubber surface treatment, mirrored copper-coloured lenses like the internal part of the frame. The internal surface of both the bridge and the temples also share the colour of the bike frame and some details of the Ducati Scrambler Italia Independent: copper with a “brushed” effect. The final element of this custom product is the dedicated logo inside the left temple preceded by the words “Unique Edition for” while the Italia Independent logo is present on the right temple. Great care and attention to detail, both inherent characteristics of Ducati and Italia Independent, allow this eyewear to embody perfectly the lifestyle spirit of Ducati Scrambler. The complete range of sunglasses inspired by the iconic bike includes four other models based upon the different versions of the Ducati Scrambler, reproducing their aesthetics and colour schemes. The new bike and eyewear collection are just the first concrete result of this creative collaboration between the two brands. “Art Basel has a certain charm which makes the launch of this all-Italian partnership even more special. Style and technology, heritage and innovation, but more than anything else cohesion and synergy between the two teams, consisting of men and women working together, are the true strength of our two companies and the key to success for this collaboration,” commented Lapo Elkann, Co-Founder and Chairman of Italia Independent.